Cutting Edge Supply offers a full line of scraper machine and asphalt paver replacement and wear parts. We also provide parts for stationary asphalt incline elevators and mobile windrow / pickup machines. Our scraper and asphalt machine chain, idlers, rollers, and sprockets are manufactured to our prints and assembled and tested in-house in order to meet or exceed the OEM standard. We offer the highest quality chain in the industry and all of our rollers and idlers are heat treat steel for maximum wear life. 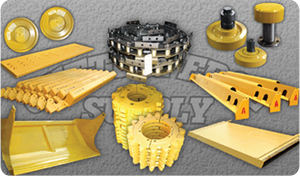 For scrapers along with the chain, rollers, and sprocket; we offer hitch pin kits and bushings, dead axle and axle housings on exchange, complete stationary and moving floors, trunions, hydraulic rods and cylinders, paddle flights, ejector skins, router inserts, moldboards and edges, floor rails, links, locks, guides, hanger brackets, side skins and can liners, as well as stinger plates and bumper channel. We also offer apron rebuild kits or can rebuild aprons for you. Cutting Edge Supply services windrow pickup machines with flights, chain, floors and sprockets to help keep your rolling stock running.